Royal palaces, epic (though recent) Cathedrals, crystal palaces not in London, (not so) cubist squares, angled buildings, NHL on the TV, a small river, where bulls come to die and lobsters come to be eaten and finally watching rugby in an Irish pub. 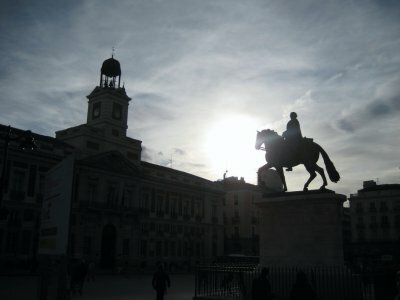 Hopping off the train from Salamanca, the grand tour of Iberia continues (and eventually ends) in Madrid. 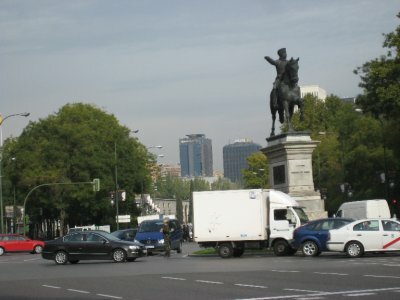 Madrid is the capital of Spain, and its largest city as well. 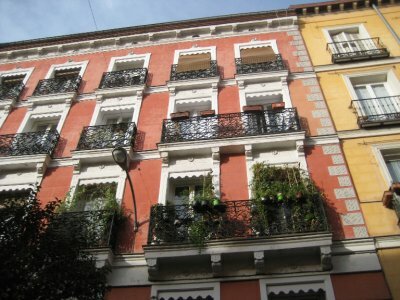 In fact, Madrid is the third largest city Europe (behind London and Berlin) and fourth largest metropolitan area in Europe (behind London, Paris and Istanbul - though that’s only really half in Europe). 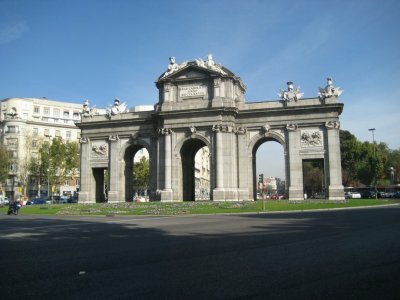 Madrid is situated on the large central plain of Spain, and is situated at 667 metres above sea level (2188 ft). Not enough that I found myself puffing walking up and down stairs (as I did in Denver), but enough that I noticed that two pints was enough to give me a touch of the wobbles. 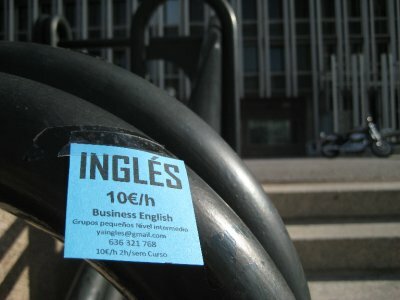 I’m a cheap drunk in Madrid. 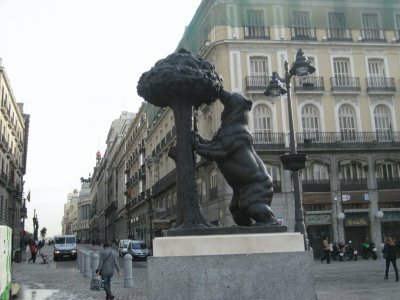 Since the middle ages, the symbol of the city has been a bear feasting on fruit from a strawberry tree, due to the prevalence of both bears and strawberry trees in the area. Other than this statue and various coats of arms, I didn’t see any bears when I was there. Perhaps they have moved out to the suburbs. 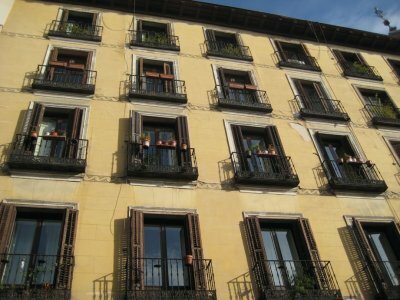 Like Salamanca, Madrid is built around a main square (Plaza Mayor), though Madrid stretches out a lot farther from its central square than Salamanca does. 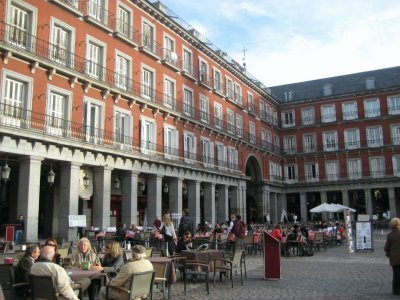 Madrid is at the geographic centre of Spain, so I suppose that means that Plaza Mayor is the exact centre of the country. 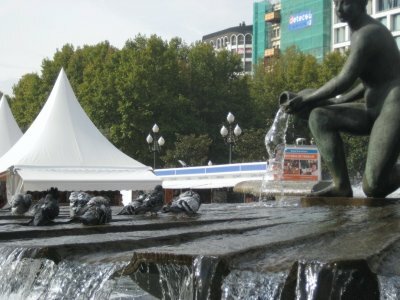 I’ve complained before about human statues, those “performers” that paint themselves grey and stand completely still, hoping that you’ll donate some money into their pot. Pointless, it’s always seemed to me. 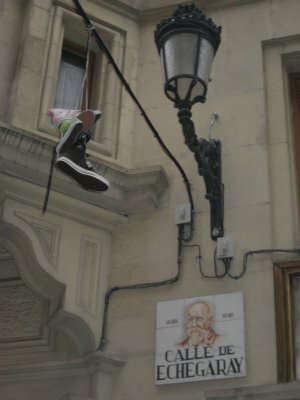 I saw a new twist on this in Madrid, with the headless statue. 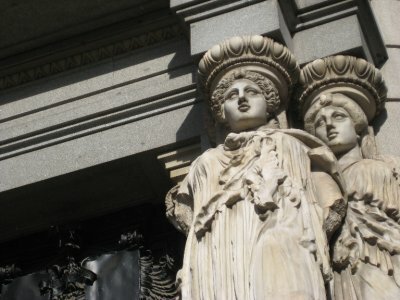 Basically, it is a human statue, but the person is wearing a really tall collar so you can’t see their head. Occasionally they will wave. If I was three, I would have probably been impressed. Of course, if I was three I probably wouldn’t have had any change to donate to a headless statue. I guess they are hoping for guilty parents to pay for the joy given to their children. 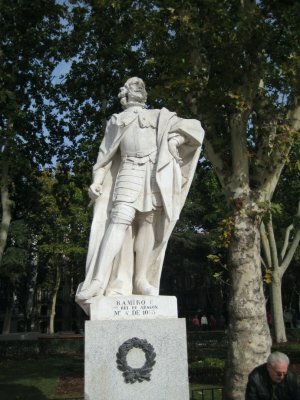 Spain has an interesting political history. Over the past 150 years, it went from a monarchy to a dictatorship to a republic to another dictatorship to finally a democratic constitutional monarchy. 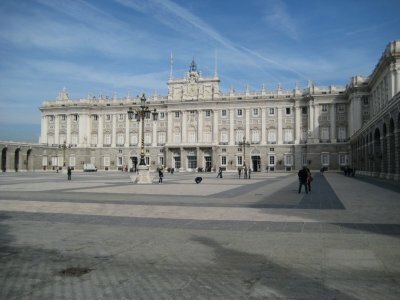 The current King of Spain is Juan Carlos I, and “officially” lives in the Royal Palace in Madrid, though it is really only used for state ceremonies. 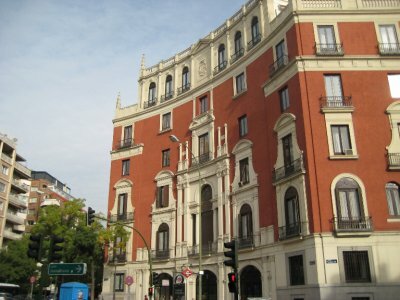 King Johnny-Charlie actually lives in a little place in the suburbs called the Palace of Zarzuela. The king is just another central city worker commuting in on the trains in the morning, I assume. Maybe he sees bears out there at his suburban palace. 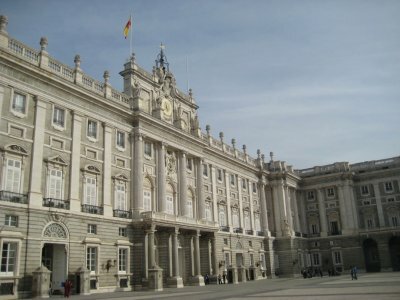 Anyway, seeing as the Royal Palace wasn’t being used for any official functions at the time I was there, I was able to take a tour of the place. 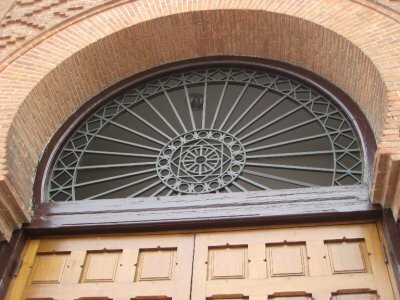 No photos allowed on the inside, but you can get a decent enough idea of the majesty of the place from the outside. 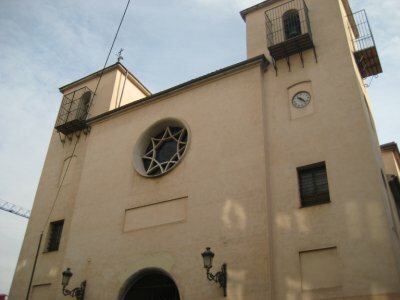 Just to the south of the Royal Palace is the Cathedral de La Almudean. 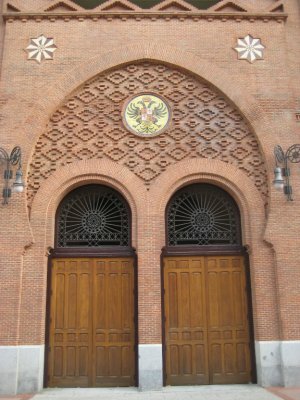 Construction was started on the Cathedral in 1879, but was abandoned after the Spanish Civil War. 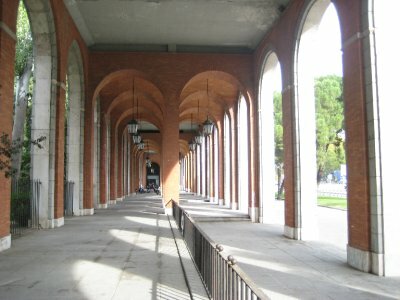 Construction was restarted in 1950, and finally completed in 1993. 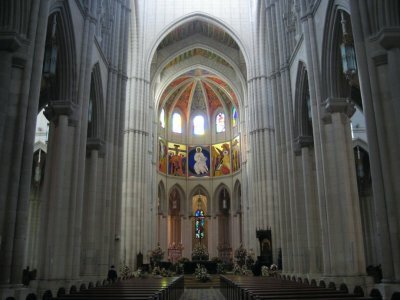 Cathedrals always seem to take a long time to build. 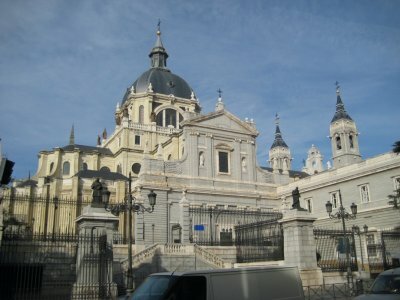 Despite taking a long time to build, the Catholic church in Spain seems to be doing okay. 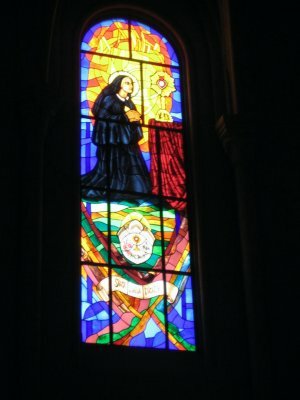 As I was walking around, there was soft organ music playing throughout the church. 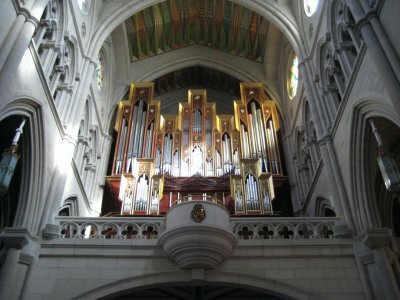 It wasn’t from the massive organ, but rather was being pumped in out of the Bose speakers attached to columns throughout the church. Bitchin’ stereo system, Archbishop. 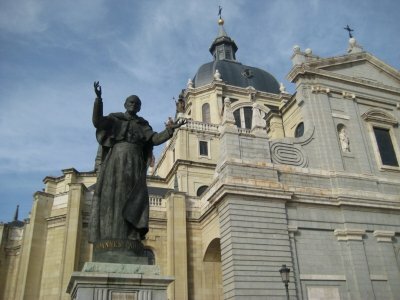 Out front they have a big statue of Pope John Paul II, who was pope when the cathedral was finished in 1993. Even in bronze, he seems more life-like than the current pope. 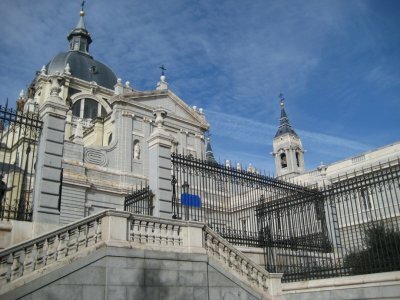 After seeing the two main tourist sites, I took a wander around Madrid. 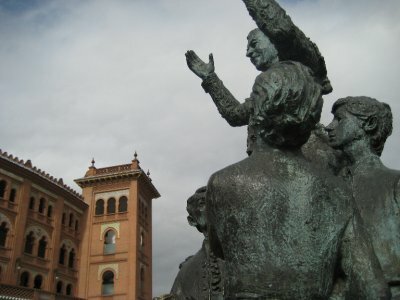 Took in sites like the Plaza de Espana, Plaza de Oriente, Rose Garden, Puerta del Sol and points in between. I shall run you through! 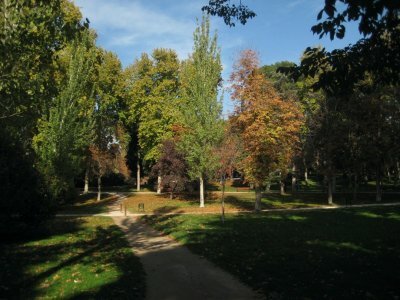 After lunch, I headed over to the other side of Madrid to check out the Parque de El Retiro. 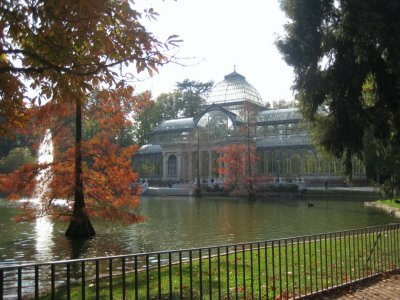 Known officially was the Parque del Buen Retiro (the park of the pleasant retreat), most folks just call it El Retiro. 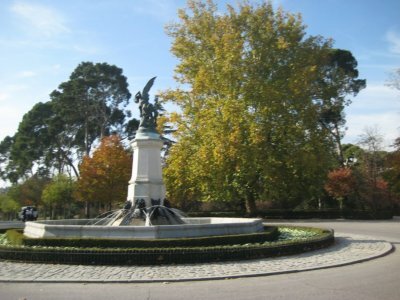 Three-hudred-fifty acres of green space, it is known as the “lungs of Madrid.” It includes the Monument to Alfonso XII overlooking the Retiro Pond and the Crystal Palace, inspired by the place of the same name in London. 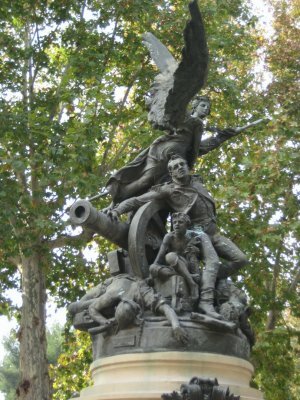 There is also a statue by sculptor Ricardo Bellver called El Angel Caído, inspired from a passage in Paradise Lost by John Milton. 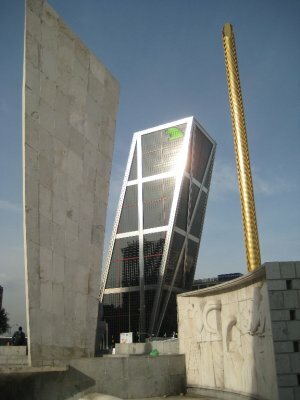 The sculpture represents Lucifer falling from the heavens. 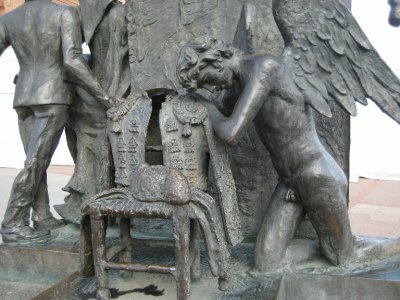 It is claimed this is the only known public monument to the devil, though I somehow doubt it. 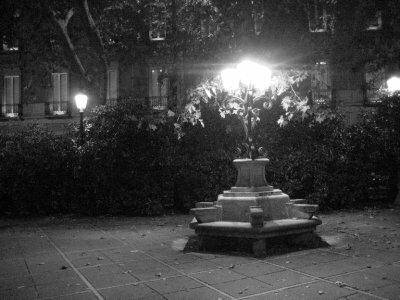 Anyway, my camera was momentarily possessed by a demon of ill-focus, so my picture of the fountain is mucho fuzzy. 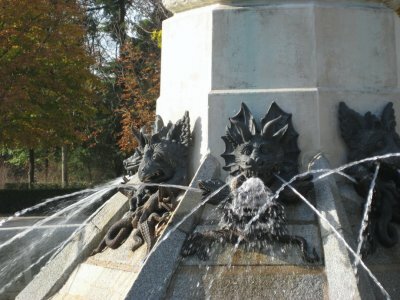 I did at least get this in focus close up of the dragons spewing water at the fountain. That was a lot of wandering, so time for a break. 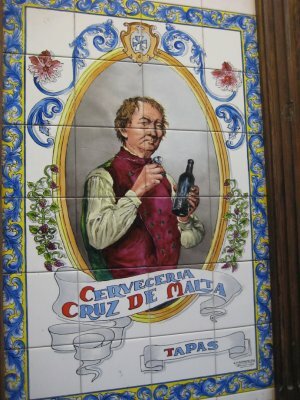 Cervezas, Vinos and tapas sounds good. 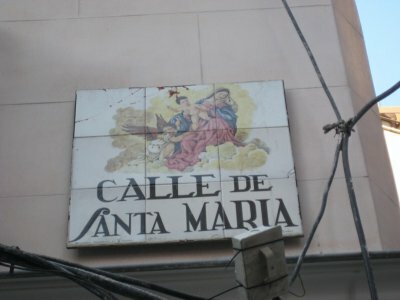 Streets in the central part of Madrid have decorative signs for their street names. 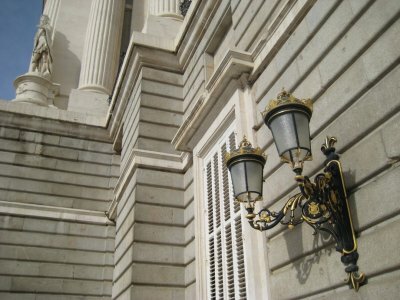 In addition to the street name, they have a picture depicting the name of the street. 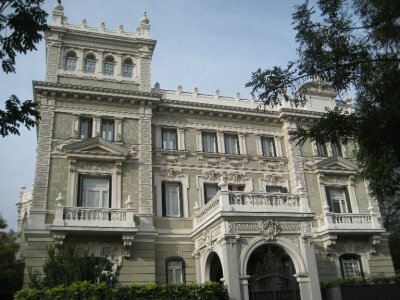 I was staying at the Hotel Ingles, which was described as being a faded glory by some of the reviewers on hotel review sites. It’s really not that faded, nor glorious. 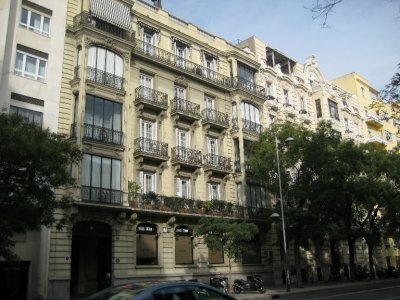 Especially when compared to my hotel in Buenos Aires, the Hotel Reina. 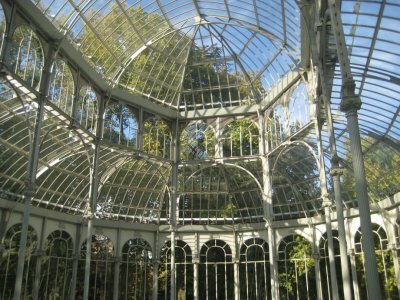 It had Marble stairways, stained glass windows, 25 foot ceilings and a wrought-iron elevator cage for the glory part. For the faded part, the elevator didn’t work and smelled of electrical smoke and the carpet in the lobby was threadbare. Now that is faded glory! 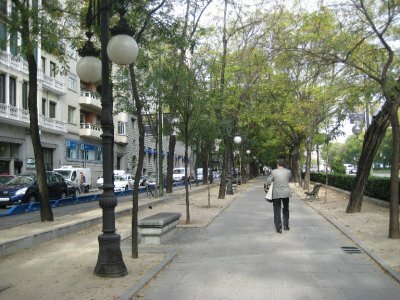 Back to Madrid (which incidentally reminded me a lot of Buenos Aires - though I suppose actually it is more the other way around - Buenos Aires is Madrid-like, as Madrid was built first). 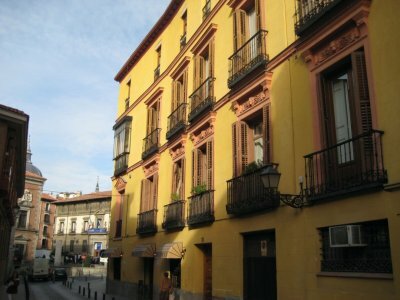 The hotel Ingles dates back to the 1880s (the specific year seems to be in doubt, even in the hotel’s own information. 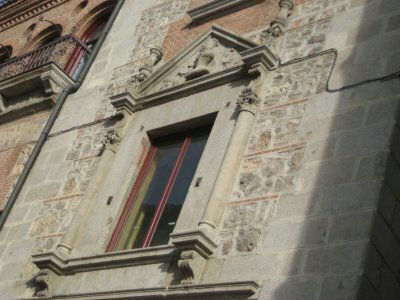 It is either 1882 or 1886). 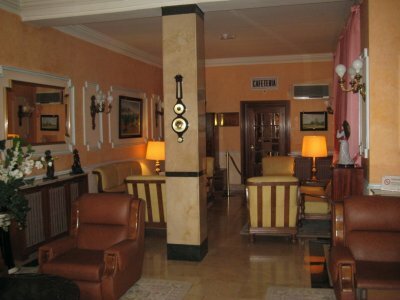 The rooms have been updated since then, though, and are clean though small hotel rooms. 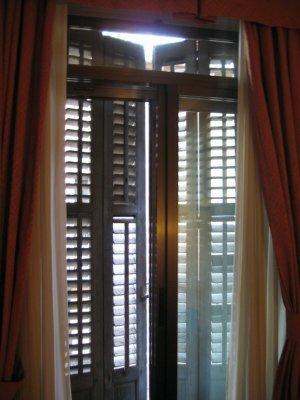 They do have high ceilings and cool wooden shutters on the windows. 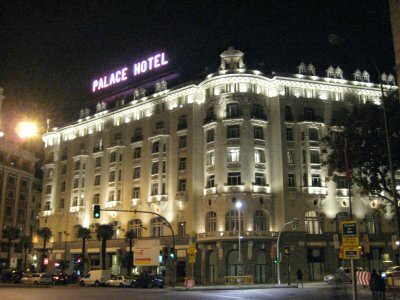 The hotel is central located, well priced, doesn’t have bed bugs and does have hot water, so that’s all that mattered to me. The hotel does have CNN. 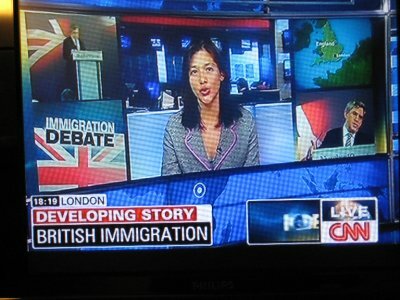 I caught this little nugget on CNN - a crack down on immigration to the UK. Hopefully they let me back in the country! 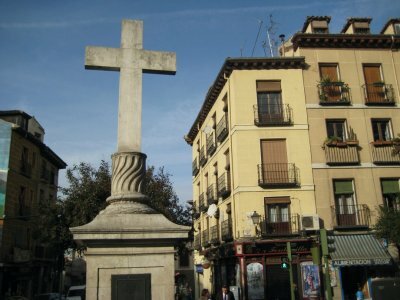 The next day I headed north, for no particular reason other than I had spent most my time in South-central Madrid the day before. 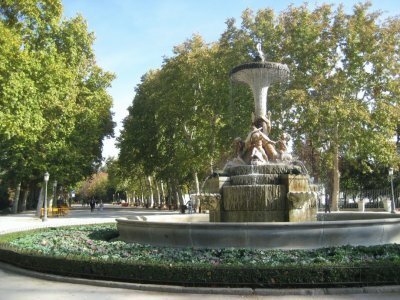 That eventually took me to Nuevos Minsterios and Plaza de Pablo Picasso. 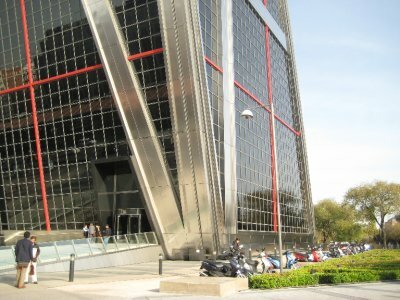 Nuevos Minsterios is a large government complex that houses the headquarters of several ministries. 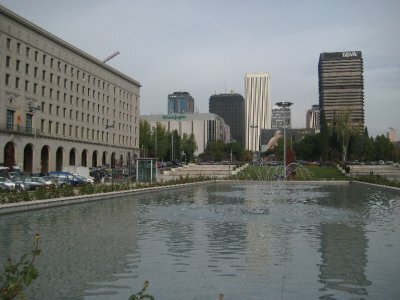 Just north of it is a large metro and train station topped by a mall, and just north of that the Plaza de Pablo Picasso. 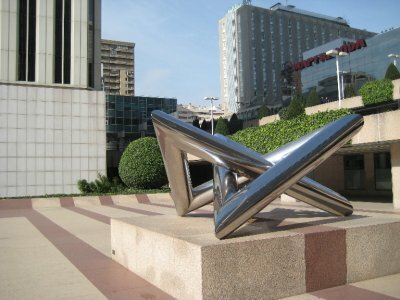 For a plaza named after Picasso, it is not very cubist. 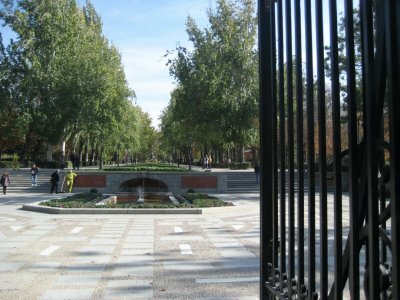 It is just a shady, green square surrounded by big tall office blocks. 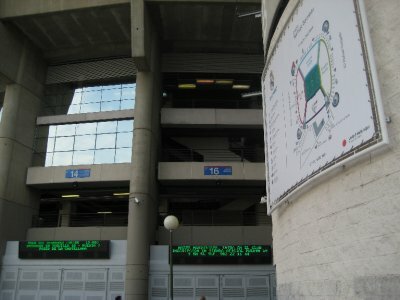 After lunching in the area, I headed just further north to see Estadio Santiago Bernabeu, the home of Real Madrid. Real Madrid is a football team in Madrid, playing in the Spanish league, and the team which houses superstars like Cristiano Ronaldo and Kaka. 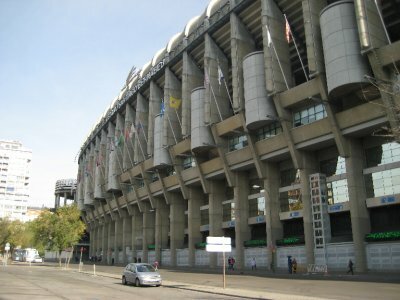 Real Madrid has also been declared the most successful club of the 20th century by FIFA, having won a record thirty-one La Liga titles, seventeen Spanish Cups, a record nine European Cups and two UEFA Cups. 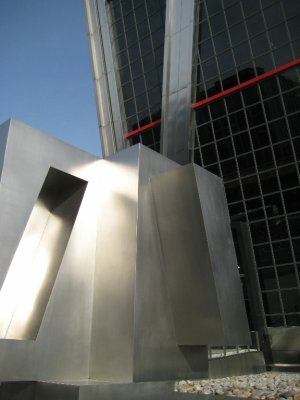 Seems a little concrete-ish from the outside. Maybe it is nicer on the inside. 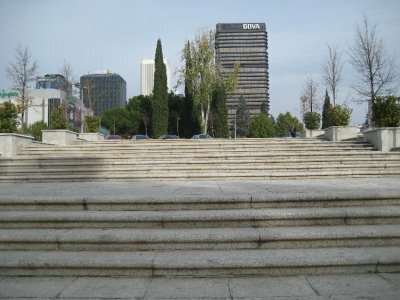 Up the street from the stadium is the Plaza de Castilla. 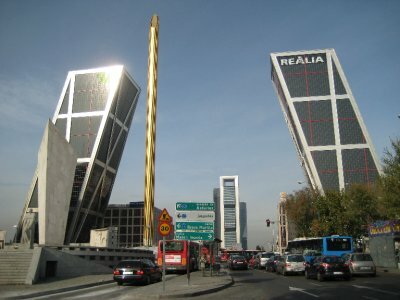 Its just a big traffic circle with a monstrous metro, train and bus station, but it has these nifty diagonal buildings. 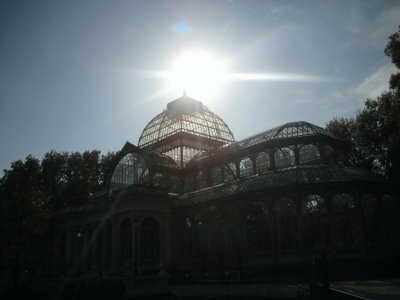 From there, I took the metro back down to Sol station, near my hotel. 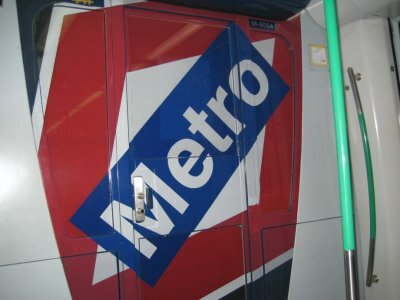 Gotta love the metro in Madrid. 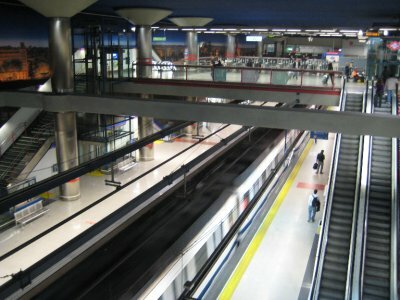 13 underground lines and 3 tram lines, it is one of the longest metro systems in the world. 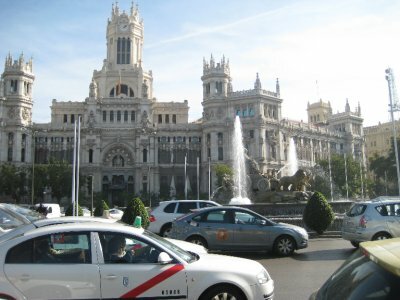 Its growth in the last twenty years has been dubbed the “Madrid miracle” and made Madrid the envy of many transit geeks the world over. Plus, it only costs €1 to get almost anywhere on the system except the furthest outer reaches. That evening, after 6 meals in a row of tapas, I decided to go for a full-grown meal, and hit a Mexican restaurant near my hotel. 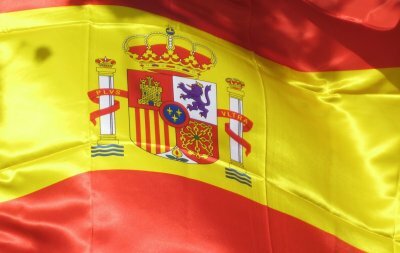 It was nice to see that all the Mexican stereotypes that one sees in North America, and no doubt makes Mexicans cringe, are alive and well in Spain as well. 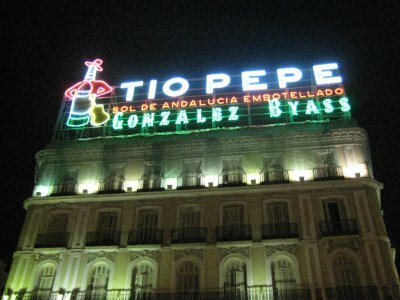 Sombreros and maracas, festive lights and waiters saying “Si, Senor” like Speedy Gonzales. Despite being a Mexican restaurant, I don’t recognise any dishes on the menu. I order something with the word pollo in the name. It was okay. The Mexican beer was cold. 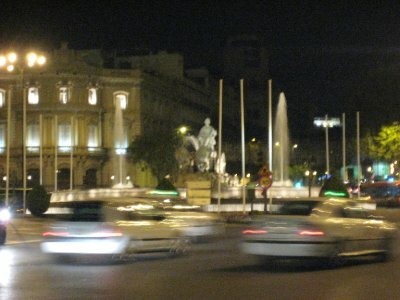 After dinner, I took a wander around the area near my hotel. Wandered out, I hit a bar. I randomly choose a place near my hotel, chosen mostly for the short distance back to my hotel. Seemed a typical, small, lounge. 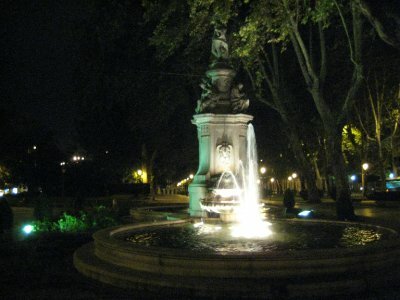 Lots of comfy and hip grottoes and groups of young Madrid-ites hanging out, just gearing up for a long night out. Trance and dance music playing over the sound system. Waitresses that were stunning. One of them looked like former 1980s Canadian VJ Erica Ehm. 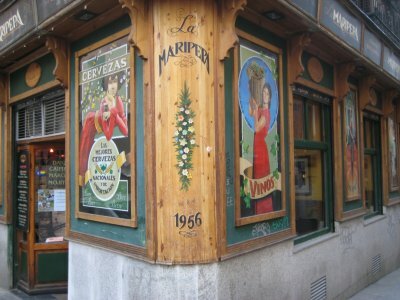 So what does this hip, lounge bar in the middle of Spain have playing on the TV? A replay of the National Hockey League’s game from the previous night of Ottawa vs. Philadelphia. I was, needless to say, the only person in the entire bar that was watching the hockey. 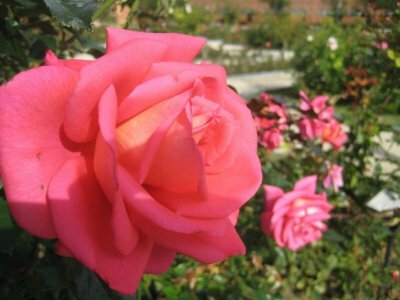 I thought that perhaps I had died and gone to heaven - after all I had a teenage crush serving me and hockey on the TV. Then I got the bill for the beer. €4.50 for a half-a-pint. Nope, I’m still on earth. I headed back to my hotel and crawled into bed. Turns out my room overlooked a street that was a big night out for a Friday evening. The party kept going and going and going. Finally, at 6 AM the noise stopped and the revellers went home. 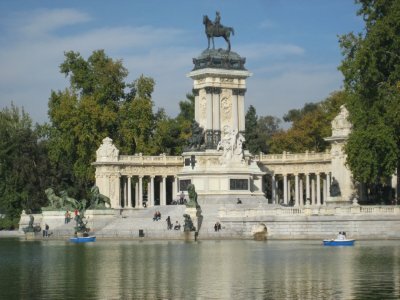 The next day, my final day in Madrid, I decided to go and see the river. 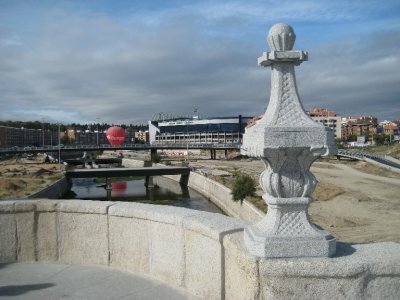 It was on the banks the Manzanares River that the city of Madrid was founded by the Moors in the seventh century, so I figured it would be an important and mighty water route through the city. The river is pretty tiny, actually. 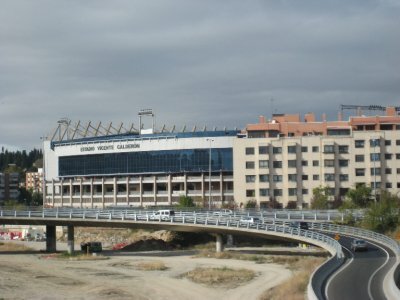 On it’s banks stands Estadio Vincent Calderon, the home to Madrid’s other football team, Athletico Madrid. The banks of the river were pretty busy the day I was there due to an international football match between Argentina and Spain. I was hungry after my walk down to the river and it was noon, so I decided to get some lunch. It was very hard to find open food. 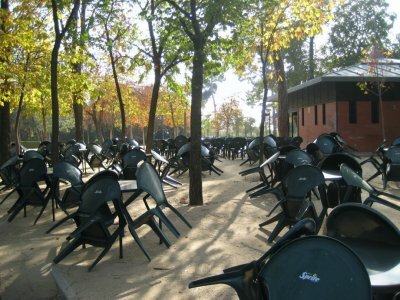 Saturday noon in Madrid is like 8 AM Sunday in London. 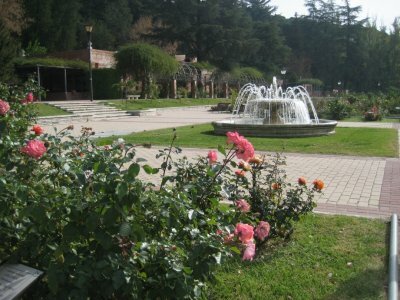 Only joggers, young families and old people are up. There are no stores open. I guess that makes sense as party people were up until 6 AM. Everyone is still in bed from the night before. I was cranky without my lunch. I took out my Madrid map and studied it. 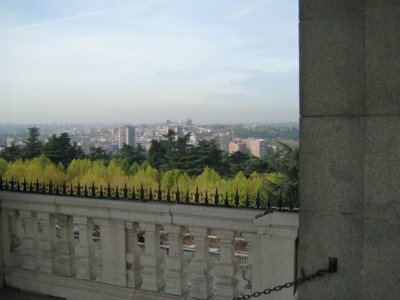 I hadn’t done much research on Madrid before coming, and basically had just focused my touring on the points of interest listed on the map. On arriving and first looking at the map, I’d picked out a few places on the map that seemed to be most interesting. 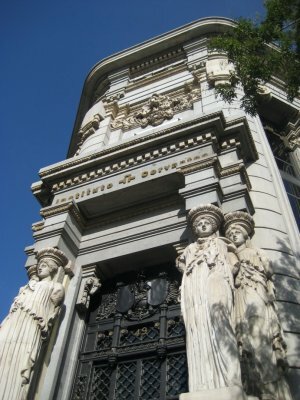 Of those, only one place still remained unvisited on my grand tour of Madrid. 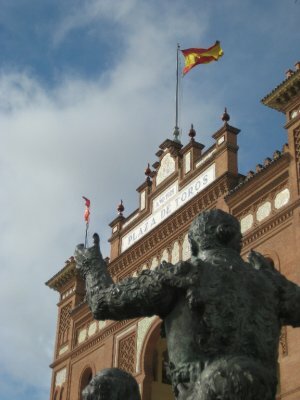 The Plaza de Toros las Ventas, or in English, the bull ring. 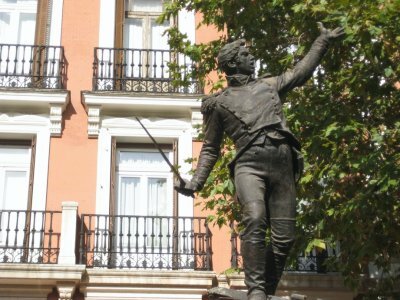 Anyway, my feet were hurting, my stomach was grumbling, and the pull of seeing the bull ring was waning as the pull of a cold beer and warm meal in central Madrid grew. I spent a minute staring at my Madrid subway map and thinking about the two different routes I could take - one to the bull ring and one to Sol station. 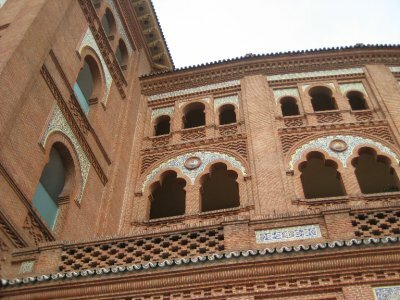 At this point, the vacationer in me meekly said, “a little rest wouldn’t be a bad idea.” He got shouted down by the grant tourer, though, and off me and all my personalities went to the bull ring. 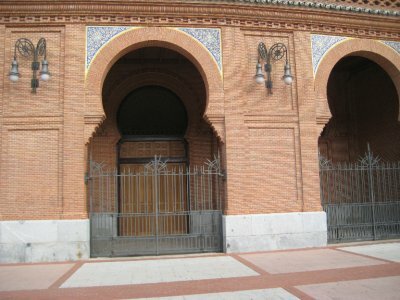 The bullring was opened in 1931 after the previous bullring proved to have too few seats. 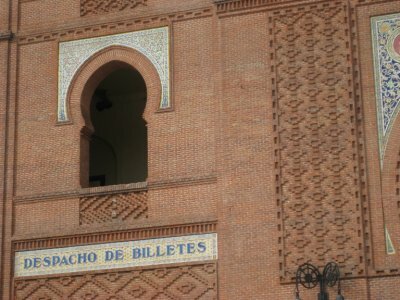 The new bullring, built in the Neo-Mudéjar architectural movement that pays homage to the Moorish history of Iberia, holds 25,000 people. 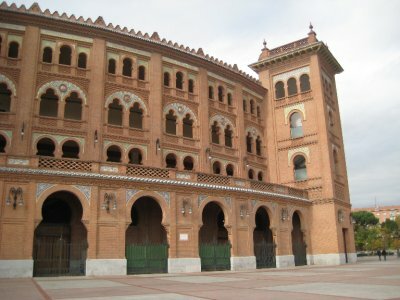 In addition to bullfighting, the bullring holds concerts, tennis and when I was there, a circus. 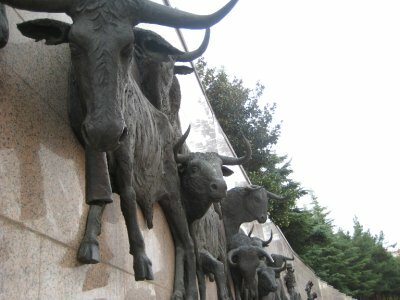 I wonder if the elephants get spooked by all the ghostly bulls wandering the pitch of the bullring? 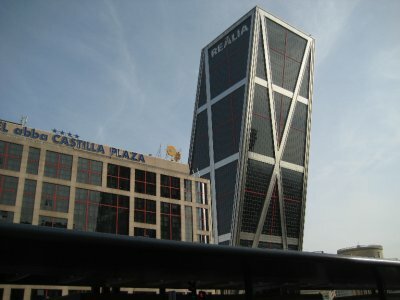 Not only was the grand tourer in me satisfied by seeing the bullring, but the stomach in me was satisfied as well. 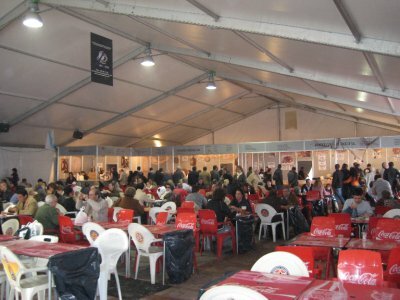 For outside the grounds of the bullring, Madrid was hosting the Fiesta Gastronomica del Marisco de Galicia y Artesania en Madrid. 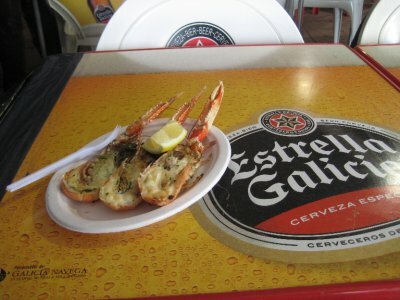 My Spanish ain’t great, but I recognised enough words to piece together “Seafood Festival.” Oh yeah. 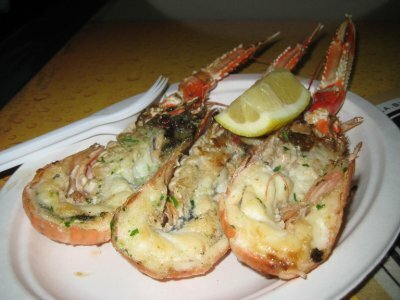 €14.00 for three lobster tails. Right on! Hands still covered in butter, I looked at my watch. It was still early afternoon, and my flight back to London wasn’t until nine in the evening, but even the grand tourer in me was too tired to continue. 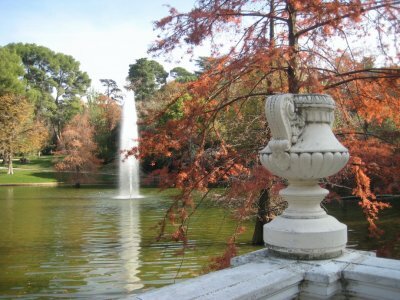 My thumb was still hurting from the spill I had taken in Sintra, I had a blister on the big toe of my right foot, my right achilles tendon felt like it was on fire and the instep on my left foot sent pulses of pain up my leg with every step. Because I had only planned a week in places I hadn’t been before, I had packed it full to the gills with activities. 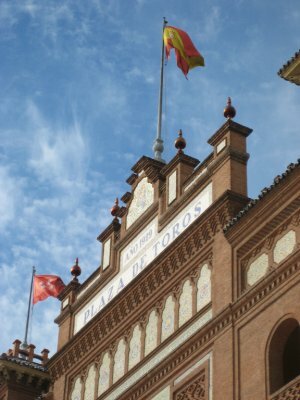 The only day “off” I had taken was on the Monday, and that day off included a tour of the area around Oriente station followed by a six hour train ride from Lisbon to Madrid. The previously meek voice of the vacationer finally got his say. 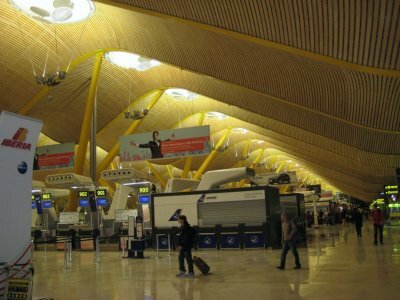 My personalities were all in agreement, so we grabbed the metro back to central Madrid where we had a few pints in an Irish pub, watching sports on the big screen, until it was time to collect our luggage and head out to the airport. After seven jam-packed days, I was ready to go home.